The BSIF Product Innovation, Service, & Safety Solution Awards promote the importance of innovation and underline the highest standards of excellence within occupational Safety and Health. The awards will give the winning manufacturers and suppliers pride of place at the NEC event and the winners will be presented at The Safety & Health Excellence Awards evening on Wednesday 10th April 2019 at the Vox, Birmingham. An award for products that are new and innovative and will contribute to improvements in occupational safety & health. To enter the awards all you need to do is download the 2019 awards brochure which will give you all the details required. The closing date for the awards entries is Thursday 31st January 2019. 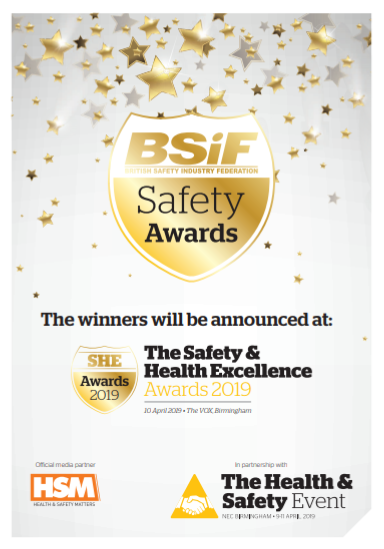 BSIF CEO Alan Murray added: “The prestigious BSIF Safety Awards recognise excellence within the safety industry, excellence in customer service, product innovation and have the key goal of improving occupational health and safety. The awards are an ideal opportunity to highlight your achievement and your company’s efforts in this vital field. The awards help us to celebrate this amazing industry”. If you have any questions please get in touch with us either via email: enquiries@bsif.co.uk or by telephone: 01442 248744.